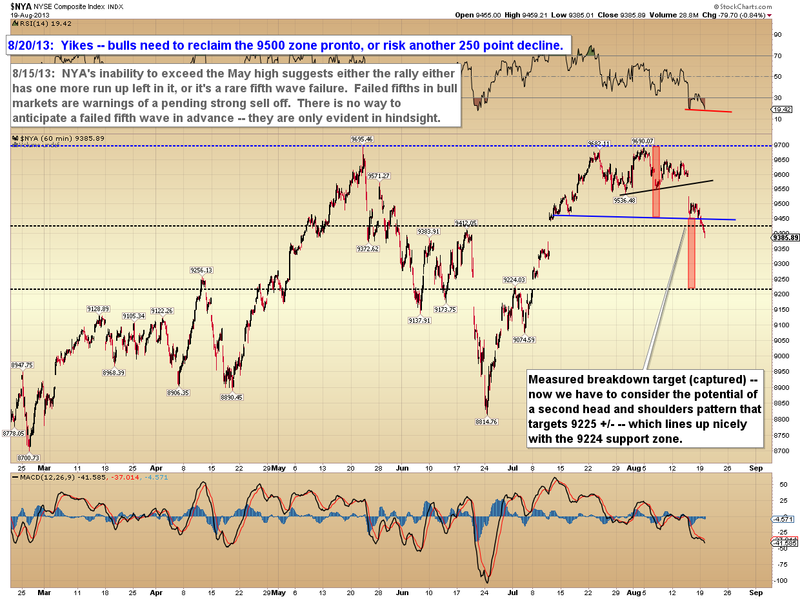 There's a surprising amount of complacency in the market at the moment. Recent sentiment polls indicate that most people feel this is just a run of the mill correction and aren't the least bit worried about it turning into anything serious. That's not a terribly good sign for bulls, since it means the market will, at the very least, probably need to shake them up pretty badly. The "easy" move in trading is almost always the wrong one -- and if it's still easy to buy the dip, it's probably not the right move. It will be the right move when it feels like it's the dumbest thing in the world. 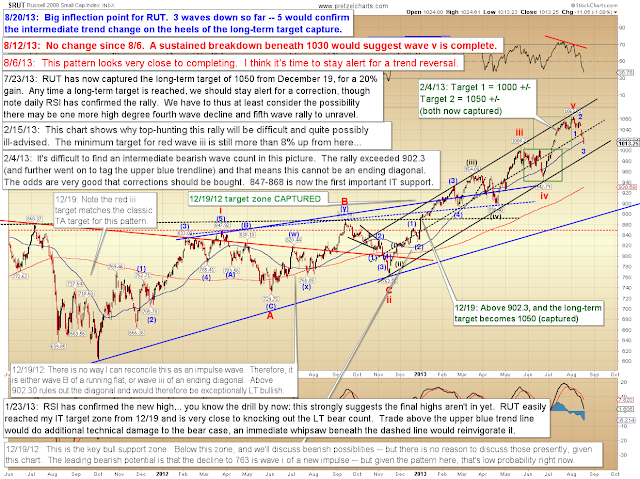 I believe the downside potential exceeds the upside potential relative to current price levels. 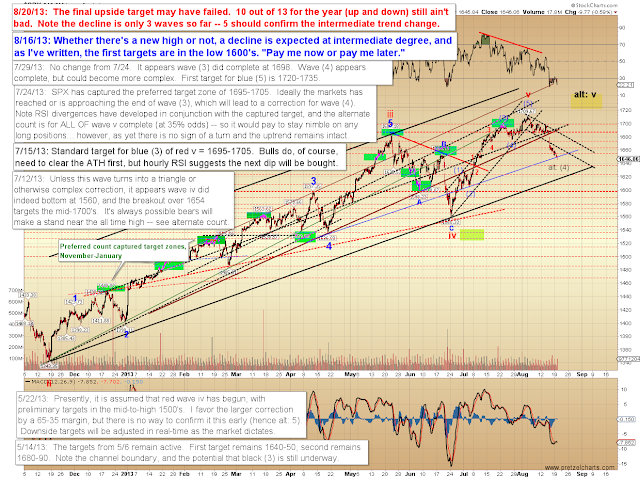 While the near-term still allows for another wave up to new highs, I would be quite surprised if bears don't win this battle at intermediate degree. 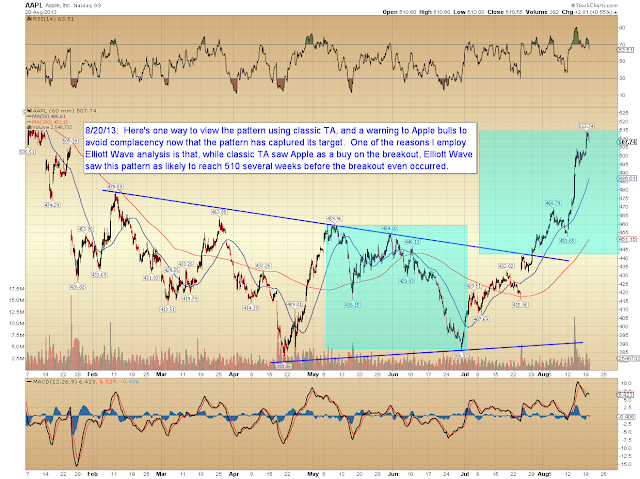 Hopefully that helps clarify my current stance, and it represents a material shift of my long-term stance in January. I'm no longer long-term bullish, but am now in "sell the rallies" mode until proven otherwise. 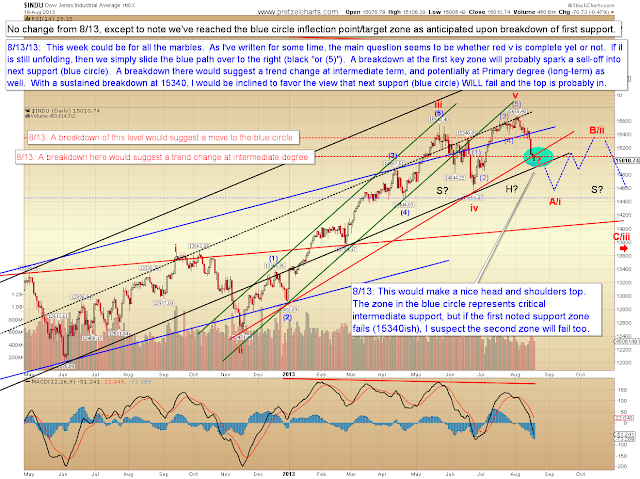 The decline so far is only three waves, so an intermediate trend change hasn't been confirmed. Once we have a full five wave decline, that should be confirmation, and tell us to expect a rally, then another decline of equal or greater length. 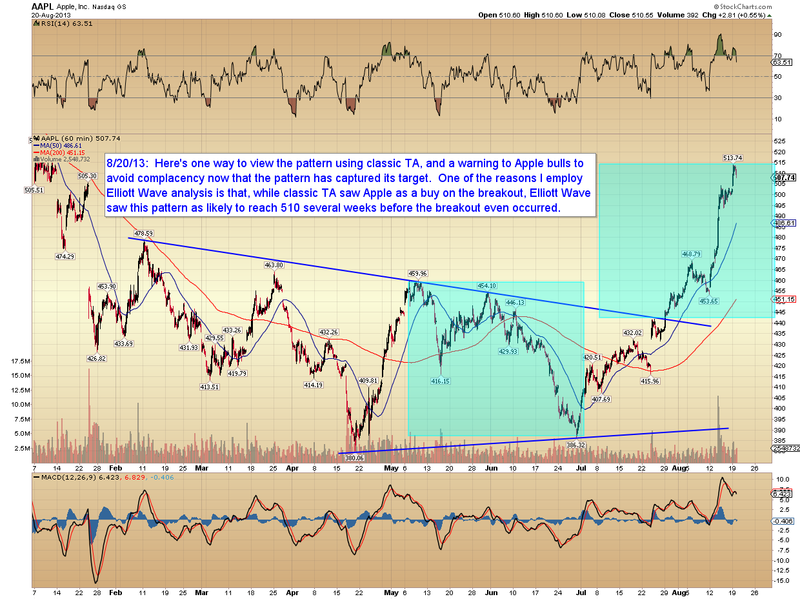 Despite the non-confirmation, the early signs point to a trend change. 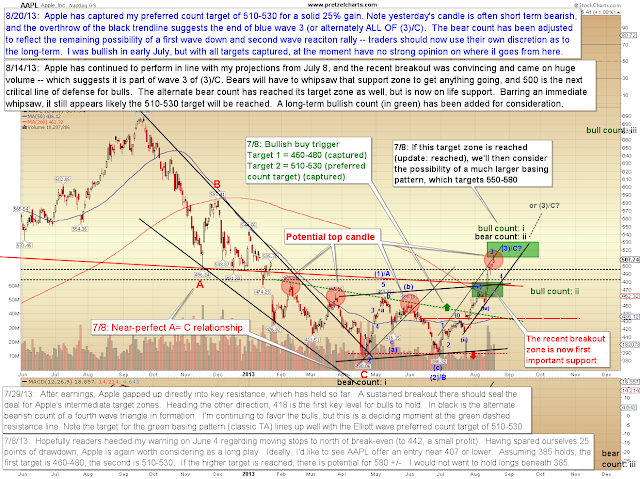 The Dow Jones Industrial Average (INDU) has reached the breakdown target, and I went on record August 13 saying that if the first support zone failed, my expectation was that the second one would be reached, and would fail as well. The first part has come to pass, and the moment of truth is here for the second half of that prognostication. 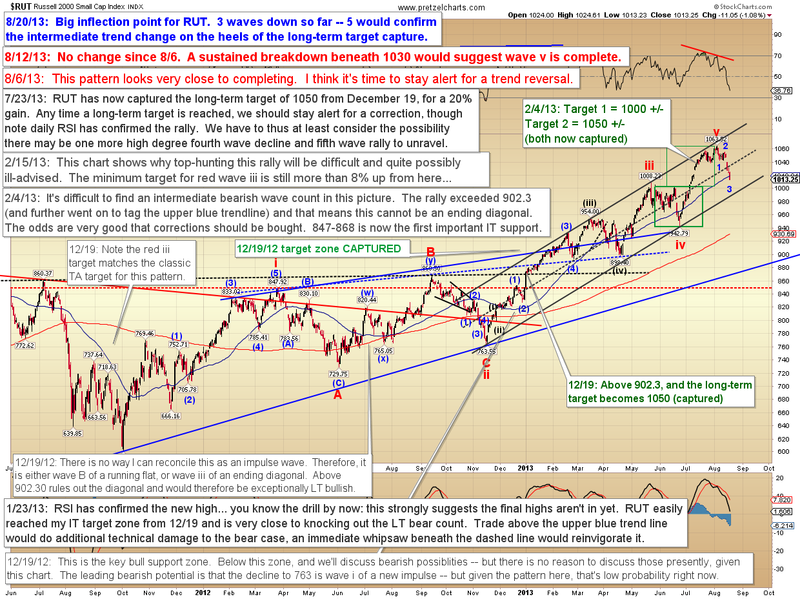 Of note is the fact that INDU has overlapped the wave (1) high, which rules out a low-degree fourth wave for INDU. The projected path is unchanged from 8/13. Bulls need to keep the decline as a three-wave form to continue their intermediate hopes -- so unless they reverse the market immediately, it appears S&P 500 (SPX) will fail to reach the final target. The NYSE Composite (NYA) has reached its downside breakdown target -- and now broken down from a second potential head and shoulders. 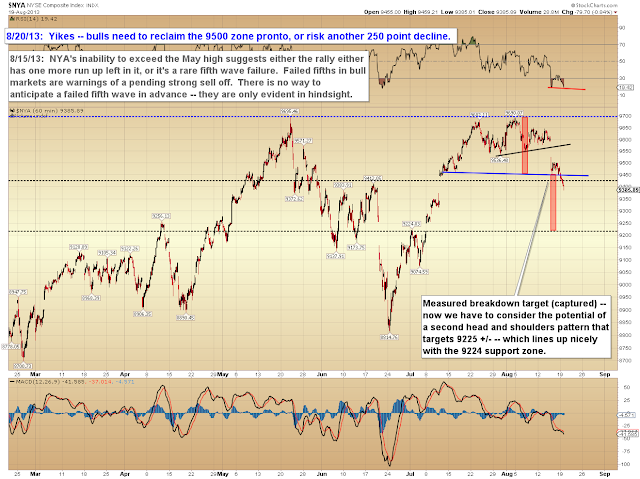 Bulls need to reclaim the 9500 zone. Apple (AAPL) has now reached my preferred count target zone from July 8 of 510-530. There's probably more upside left, but I took some profit at 510 (since that's how I trade when my targets are reached) and have choked-up stops on my remaining positions. 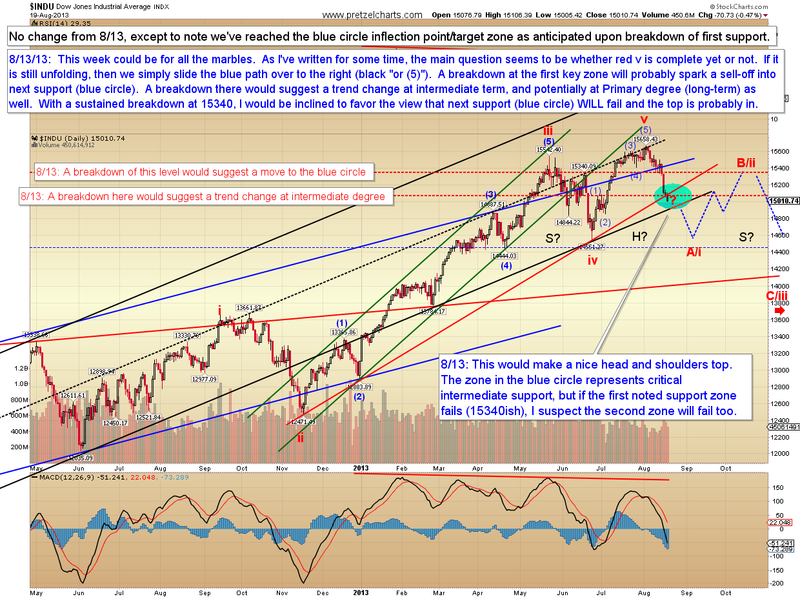 In conclusion, the market is now 3/5ths of the way toward confirming an intermediate trend change. The overlap in INDU has confirmed that this is a higher-degree correction (in other words, it's not part of the last rally), and that in itself does suggest the anticipated intermediate trend change has most likely begun. Trade safe.